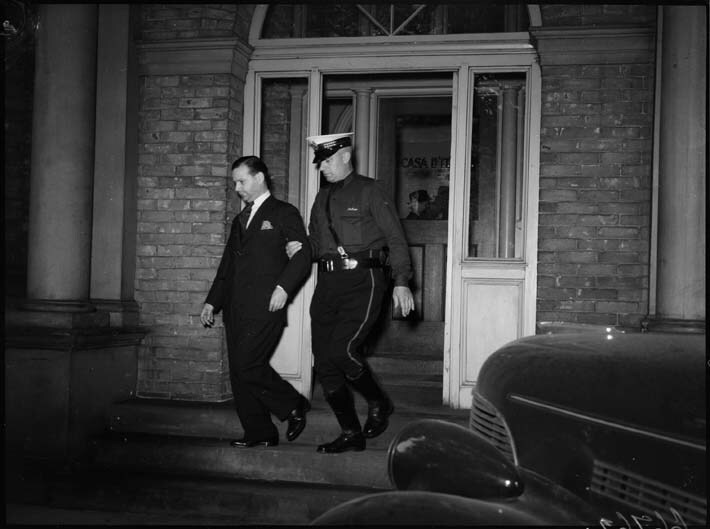 Black and white press photograph depicting a uniformed police officer escorting a man in a suit out of the front doors of the Casa d'Italia building in Toronto. A police car is in the right foreground. The building is located at 136 Beverley St and was purchased in 1937 for use as the Italian Consulate. The building was known as the Casa d'Italia and became the meeting grounds for Italians living in Toronto. After the police raid on June 10, 1940, the building was taken over by the Government of Canada and for almost twenty years was used as a barracks for the Royal Canadian Mounted Police (RCMP). In 1962 the Canadian Government returned the house to the Italian community as a training centre for immigrants and in 1977 the building again became the Italian Consulate.